A new ‘tag team’ simulation which draws on elements of theatre, drama and improvised acting is helping nursing students focus on patient safety before they graduate as Registered Nurses. See more CQUniversity videos by visiting our YouTube channel. 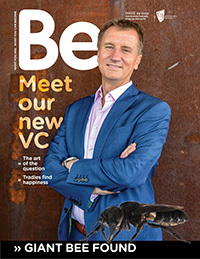 Be Magazine is CQUniversity’s official magazine, packed with news, features and images that showcase our university and our region. Grab a copy of the latest issue of Be at your local CQUniversity campus or view it online.